Signs of life, as well as death, can be found on many Brooks County ranches. Presnall Cage was driving the outskirts of his ranch when he saw the black tennis shoes. The sight of them up ahead, neatly arranged in a rut of the sandy road, filled him with dread. Several vultures perched in a sprawling live oak tree near the road, and two more flew in lazy circles. He already knew what he would find underneath the tree. This time it was a young man — what was left of him — his body already decomposing in the heat. In his pockets were US credit cards and an ID. It was always a sad thing to witness, yet another life lost on his land. Like hundreds of others in the past decade, the man had died in Brooks County, Texas, trying to circumvent an immigration checkpoint two miles south of Cage's ranch. He called the sheriff's department. By now he had the phone number memorized. Though 5 years ago, most migrants crossing Brooks County were Mexican, the majority now come from Central America. Most rely on cartels and organized crime at some point to make the journey to the north. Not counting his time in the air force, Cage has, like his father before him and his grandfather before that, lived his entire life on his family's sprawling south Texas ranch. He's seen migration through his land ebb and flow, but he's never seen so much desperate humanity coming through as in the past few years. Cage believes the Obama administration is allowing the current influx of unaccompanied children and families from Central America to come across the border to help the Democratic party. “They need new recruits who will vote Democratic,” he says. But while his feelings about illegal immigration frustrate and even anger him at times, when he encounters people on his ranch who need help, he can't help but feel sympathy for them. Rancher Presnall Cage has come across numerous migrants on his land in need of help. Read more from our award-winning series, “Beyond the Border,” which exposes the brutal violence driving Central Americans to risk crossing the border into the United States — and the deadly risks they have to take on that journey. Most of the people who knock on his door these days come from Central America, a significant change from just five years ago, when 90% of the migrants passing through south Texas were from Mexico, according to Border Patrol apprehension figures. In 2012, US government data showed that for the first time in 40 years, net migration from Mexico had reached zero. 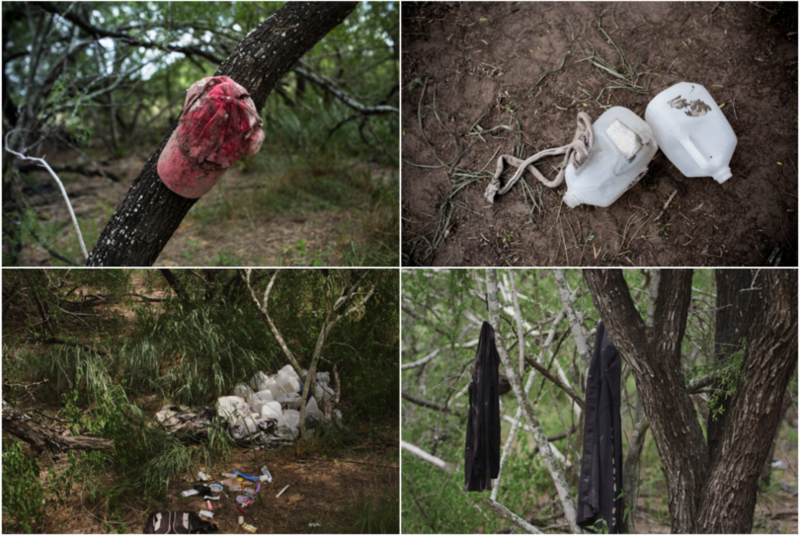 But apprehensions of Central Americans coming across the south Texas border have tripled since 2011. The southernmost tip of the Texas-Mexico border is the shortest distance from Central America to the United States and the most traveled route. It's been tough to adjust to the influx, he says, and hard not to feel resentment. 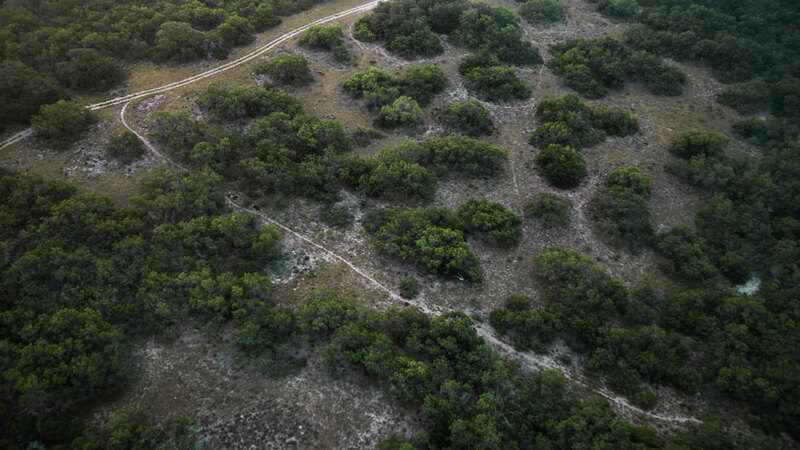 In Texas, private property rights are sacrosanct, and they are fiercely protected in Brooks County, where nearly all the land is privately owned. What Cage wants most is a return to the days when people didn't routinely venture across his land, he says. Ranchers covet their quiet way of life, governed by a set of rules they call “ranch etiquette,” he says. “You don't ask a man how many acres he owns because it's like asking to look at his bank account. You don't enter someone's land without asking permission first.” That way of life is slipping away. Farther down the road is a small pond. A white egret poised on its stilt-like legs surveys the shallows. “This pond is named after my son Grady,” Cage says. It had always been his eldest son's dream and his dream too that Grady take over the ranch when Cage retired. “That was the plan since he was little,” Cage says. But Grady died in 2012 at the age of 34, from cancer. “He fought it for 13 years,” he says, looking out at the pond. Cage has had the flotation devices that trigger the water pumps for his cattle troughs ripped out by people looking for water, and sometimes migrants leave the gates open and cattle get lost. Then there are the hundreds of pounds of litter left behind every year on his ranch – everything from discarded water bottles and cans to backpacks, toothbrushes and cell phones. In the winter months, his cowboys do trash duty, scouring popular hiding places and migrant drop-off points for the detritus left behind. Cage blames the checkpoint for all of the traffic on his land. “That's the squeeze point,” he says. “The McAllen ranch south of here doesn't have the same problems we do.” The US government built the checkpoint without any consultation with local ranchers or townspeople, he says. In the next decade, the US government plans to double the checkpoint's size from four to eight lanes and add several more agents. A Border Patrol bust on Cage's ranch this June brought in seven large bales of marijuana. Five men were detained; two escaped. 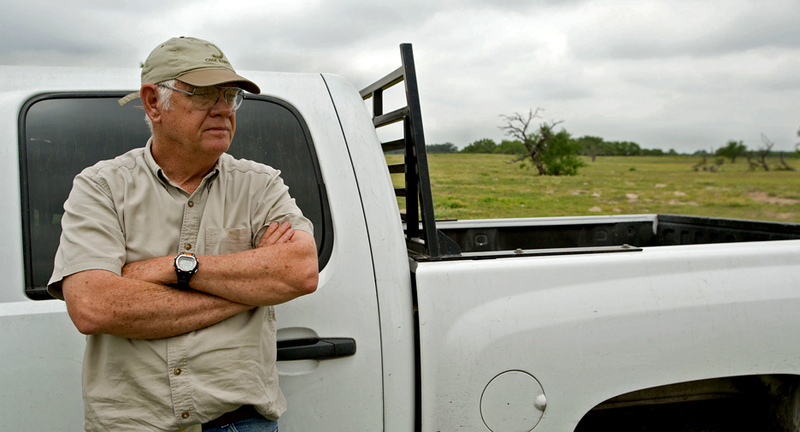 Dr. Mike Vickers, a rancher, heads a citizens' militia called the Texas Border Volunteers that patrols Brooks County to round up undocumented migrants and report them to Border Patrol. Some ranchers have taken up arms. 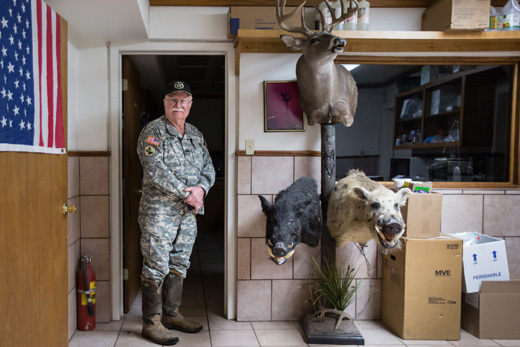 Dr Mike Vickers, a rancher and local veterinarian, formed a citizens' militia in 2006. 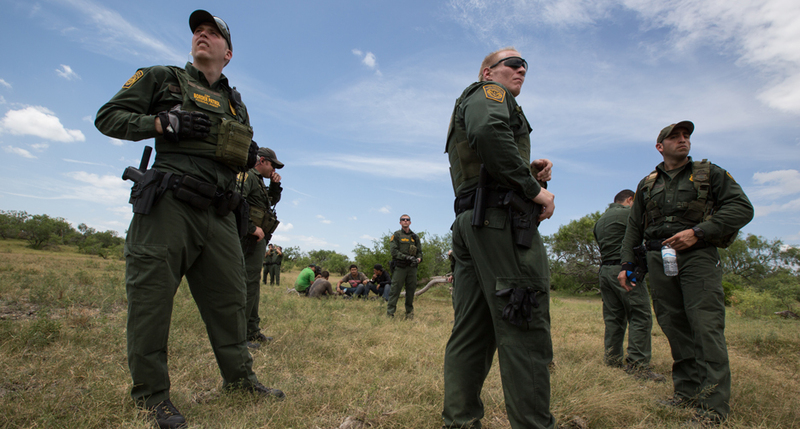 Called the Texas Border Volunteers, it patrols the county, rounding up undocumented migrants and handing them over to Border Patrol. Members of the group, which consists of ranchers, retired military and other volunteers from across the US wear military fatigues. They go out heavily armed. Cage hasn't joined Vickers' group, but he allows it to patrol his land. A number of politicians have come to Brooks County for meetings and photo ops, especially since President Obama declared that the thousands of unaccompanied children coming across the border from Central America constitute a humanitarian crisis. Still, Cage doesn't want outsiders to think that he and other ranchers are heartless. When he first started finding bodies more than a decade ago, he installed faucets along his water lines, marked with bright blue railroad ties so they can be spotted from a distance. Recently, he was approached by Eddie Canales, who opened the South Texas Human Rights Center in Falfurrias last year, about installing 55-gallon barrels filled with jugs of water on his ranch. Canales, a newcomer from Corpus Christi, 80 miles away, has had difficulty making inroads with local landowners, who are suspicious of an outsider. “You have to be careful about who you allow on your property, because it's a liability,” Cage says. “You can get in trouble if you're too sympathetic.” Even so, he's allowed Canales to install two of the water stations on his land, which helped Canales gain credibility in the eyes of other landowners, so he could install more water stations and save lives. Texas Observer staff writer Melissa del Bosque is a 2014-2015 Lannan reporting fellow with The Investigative Fund at The Nation Institute, now known as Type Investigations, now known as Type Investigations.